Consider yourself at one of the best locations on the mountain. BlueSky Breckenridge offers true mountain convenience and luxury. 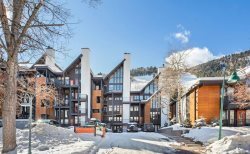 Set in between Peak 8 and Peak 9, this private condominium is just steps from the Snowflake ski lift and only 2 blocks to downtown. A true ski/in and ski/out complex, BlueSky offers 5-star accomodations across the board. During your stay at your 3 Bedroom 2 Bath condominium, you can spend time on the mountain, shopping in historic downtown and relaxing in the lobby. And, of course, don't forget to spend time in the spa and arcade located on the first floor. The spa offers an assortment of massage services, skincare, manicures and pedicures. Additional, BlueSky amenities includes concierge services, an outdoor heated swimming pool, outdoor hot tubs, complimentary on-demand shuttle, arcade room, and an exercise room. This large vacation rental condo has been appointed with upgraded decor and modern finishes. The gourmet kitchen boasts stainless steel appliances and everything a cook needs to prepare high-end meals. The three expansive bedrooms accommodate up to six guests. The master suite offers a king bed, the second bedroom has a queen bed, and the third bedroom has a queen bed. The sleeper sofa is located in the large family room. Your family of eight will find it easy to find gathering spaces in and around the area. Like most people who visit Breckenridge, the downtown core area will be a must during the evening hours. Shopping for all age groups can be found on main street along with a variety of restaurants, bars, brewpubs and nightclubs. BlueSky offers on demand shuttle service to most areas in Breck.